Daily Manna Today 8 December 2018 – THAT DRY SEASON IS OVER! TOPIC: THAT DRY SEASON IS OVER! Verse 9 of today’s scripture says, “Thou visited the earth and waterest it…” See Verse 10: “Thou waterest the ridges thereof abundantly…” WHEN GOD VISITS YOUR LAND, HE COMES TO WATER IT! That means you will end 2018 with a watered garden, life and ministry! Maybe the first six months of this year has been dry for you, maybe the land has been dry and unproductive, and you are asking in your heart, “God where are you?” There is good news for you today. That river is a river of life, and whenever it flows, it brings life, growth, decoration and fruitfulness. God will visit you in this last quarter of the year and He will cause you to experience so much increase than you can contain! The Ghost is saying to a user of this devotional today clearly: “I’m not through with you yet. There is more! YOUR DRY LAND WILL BLOSSOM AGAIN! I have come to WATER that which was WITHERED! I have not forgotten and cannot forget you. I will visit you AGAIN and you will see My greatness, honour and glory in ways that you have never seen before.” Amen! READ ODM January 2018 day 29 - HER STOLEN CAR WAS RETURNED WITH MONEY! DO IT TODAY and enjoy a NEW YEAR FIRE! (Don’t send it if you already did and you are receiving the prayers already). PRAYER POINTS: Sing your best song to your God. 1. Pray about the Word as led now. Daily Manna Today 8 December 2018 – THAT DRY SEASON IS OVER! 2. I decree: The DRY SEASON IS OVER! LORD, water my garden! Water every DRY land around my life, family and ministry (Pray it for three days seriously). 3. Praise God and worship Him for another day! 4. Pray about this quarter! Father, I receive all that You have prepared for me to enjoy in this last quarter of 2018 (Pray it seriously for three days). 5. Pray for travelers this December/January! 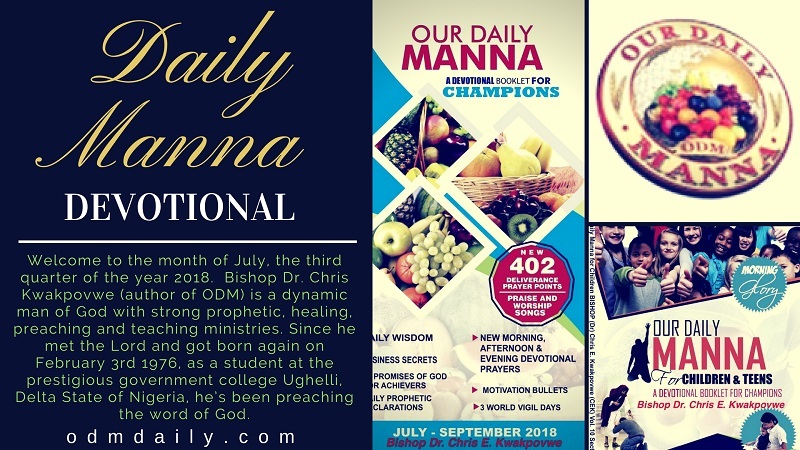 Daily Manna Today 8 December 2018 – THAT DRY SEASON IS OVER! 6. Every plot of the enemy to make the remaining days of this 2018 worse than the past months, SCATTER in Jesus name. Previous Post:Our Daily Manna 7 December 2018 – DEMONIC STONES TO STEPPING STONES!